With participants from Attac France, Solidaires, Sud PTT; from DIE LINKE/Liaison Office of social movements; the interventionist Left, Germany; Occupy Frankfurt, Germany; Plan C, UK; Euro- Nomade collective, Italy; TPO Bologna and Emilia-Romagna Social Centers, Italy; Act!, Belgium/Italy; Alter Summit, Belgium; Transform!Europe, Italy and Transform!Europe, Austria; European Alternatives. We had invited to a face-to-face meeting of the Blockupy International coordinating group with friends and comrades who would be actively interested in pursuing a “Blockupy convergence agenda” in Europe. We “used” the European wide “Rights4All-conference” organized by Alter Sum- mit on social and labour rights in Europe the days before our meeting as an occasion for us to listen and consult with activists and networks in a broader context before our meeting as well as a good occasion to get together on the very same weekend (see also: http://www.altersummit.eu/mobi- lisation/article/conference-rights4all-now-25-26?lang=en). The objective of the Blockupy International meeting then was to have a trustful and constructive dis- cussion about the political constellation in Europe, for social movements, for possibilities of convergence. From here, we wanted to get a better idea of Blockupy, its role and possible next steps (for an evaluation by Blockupy Germany on the last year’s, Blockupy’s role in Germany and possible next moves, see http://blockupy.org/en/6818/blockupy-for-a-disobedient-mosaic/). In the first part of the meeting we discussed the challenges we (understood in a broader sense) are facing in this political situation (with a fragmented Europe and its movements/progressive forces, the “EU in crisis”, the right wing/populism all over on the rise, the difficulties to create points of conver- gence and perspectives on a “Europe of below” etc.). Of course, the objective of the meeting was to relate this discussion to Blockupy and its potential/necessary role to propose concrete points of con- vergence for a “Europe from below” or a “Europe of struggles”. Therefore, in the second part of this meeting we focused on a more detailed way to delineate a political process of what to do as Block- upy (International) and decide on the next (political and work) steps. It was quickly clear that the next major step for converging or proposing a point of convergence for us (as movements/forces involved in Blockupy International and possibly European “anti-austerity” forces could and should be the upcoming G20 summit next year in Hamburg (7th/8th of July). There- fore, we also determined concrete tasks for the next months. For example, we agreed to involve Eu- ropean movements by inviting and informing them about the process. At the same time we will also get involved as European movements in the concrete No-G20 process which is already on its way in Germany (for the German anti-g20 process, the websites are only in German yet, see for the broader g20 platform: http://www.g20-protest.de/; for the planning of actions, see: https://www.g20hamburg.org). However, we understand the G20 rather as a “stage” than a goal in itself, as a possible point of con- verging “on the streets” which European movements could and should use in this fragmented moment – with the opportunity to globalize and “deprovincialize” our perspective of current struggles. However, if we see that as a step in the longer process we have to highlight that our struggles will continue after the G20 summit and that we will gather after the G20 mobilization in order to evalu- ate where we are at then. Furthermore, Blockupy International’s role in the (international) G20 process should be to act as a “motor” or initiator of a process to invite networks and movements connected to us (and the social/anti—austerity protests of these last years) into this process but not see Blockupy International as the overall European “core network” with ties to all European movements. In addition, we should try to become part of the planed G20 counter summit preparation (for July 5 and 6), the grand demonstration on July 8, and of course of the civil disobedience actions on the days of the official summit itself (primarily around July 7 when the official summit starts). For us, the targets within the official summit will not be primarily the “monsters” meeting there (as Trump, Temer, Erdogan and whoever will be elected on its way) but to target the EU politics and cri- sis management, global capitalism, and the organized chaos of the neoliberal elites. This politics of the last decades (in its European and global dimension) created its own right wing “monsters” as the siblings or offspring (that is the true meaning of this upcoming “parade of the monsters” in Hamburg). Furthermore, we have to offer a positive and strong vision of our Europe: we will show in Hamburg the Europe of solidarity and a Europe for all, we will have a strong vision of the universality of social rights born out of a Europe of struggles. Our French comrades viewed the 18th of March (with its G20 finance minister meeting in Baden-Baden and the “anniversary of Blockupy in Frankfurt) as an opportunity for mobilization in Baden Ba- den. In addition, the City Plaza Hotel (Greece) called for an international action day against austerity, for migration and social rights on that very same day (see also http://solidarity2refugees.gr/international-call-city-plaza-18-march-european-day-action/). This proposal was regarded with much interest, however, up to now there is not a network really promoting that day as international day of action. Blockupy International therefore can support that proposal and action day, but is clearly not the network capable of organizing that action day.  We are proposing to send out an open letter, invitation and proposal as Blockupy International before Christmas to European networks to take up this idea to think of the G20 summit/process of an opportunity for European movements to converge, act, mobilize. There should be a European/international No-G20 one-day meeting in Hamburg in spring to organize ourselves as a group, but also align ourselves with the G20 process (preferably the day before the next No-G20 action conference, however, the date is not clear yet). 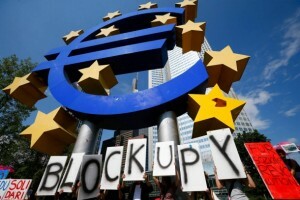 Blockupy can and should only be one amongst several other networks to organize such a meeting.